As Hurricane Sandy moved up the East Coast, Mayor Michael Bloomberg ordered an evacuation of all New York City flood zones, just as he had done before the arrival of Hurricane Irene last year. Because Irene swept through after so much hype and left the city in decent shape, it seemed we were preparing for another false catastrophe. My art studio overlooks Newtown Creek, a serene but highly polluted channel separating Brooklyn from Queens. It also happens to be in Flood Zone A — the zone with the highest risk of inundation. Walking around the building, you can see why. The elevation drop in the courtyard is like a cobblestone stairway down to the water. My studio was always considered prime space because it's relatively high on the incline. Hurricane Irene poured only a quarter inch of water on parts of the floor. In the months before Sandy, I was working on a sculpture called "American Debt." 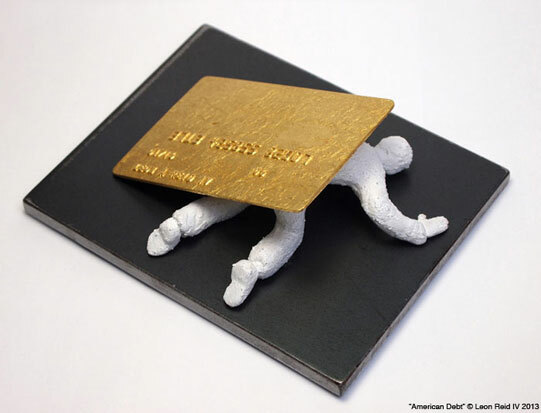 It is of a human under the crushing weight of a credit card. I splurged on the materials, purchasing 23-karat gold leaf to gild the casts of my own credit card. By late October, the human figure was cast, the steel display plates were cut and the gold leaf was blinging. All that was left to do was attach the elements together. As Sandy raged through New York, I saw images on the news of the Lower East Side with cars submerged in water. I sat in Brooklyn with my wife and newborn baby, refreshing CNN's homepage and listening to The Brian Lehrer show on WNYC. Someone called in and said they saw police and firemen rescuing someone from Newtown Creek. Thoughts of the destruction kept me up most of the night. When I arrived at my studio the next morning, the superintendent said, "Damn Leon, you got it bad. Everybody did." He pointed to a faint dark line running halfway up the doorway. "That's how high it got." He hurried away to tell someone else the bad news. I unlocked the door and opened it about an inch. A wood box that had been in the back corner of the studio now jammed the doorway. I finally forced the door open and entered into a dank, foul-smelling nightmare. The floodwater had risen over four feet high. The few untouched objects were trivial: spare wood stored in an overhead rack and some shelving units with ear plugs and bathroom cleaning supplies. "American Debt" was waterlogged and scattered among everything else that mattered. I found four of the five cast figures and three of the five gilded credit cards. The gold leaf sat wrinkled in a puddle. The steel display plates fared even worse. Heavy rust had developed on all five, and they looked like they'd been recently uncovered at an archaeological site. Fortunately, all the sculptures were salvageable, but not without considerable cost. Some works, including "The Hundred Story House," didn't survive. A relative from New Orleans called and suggested applying to FEMA for disaster relief. My wife researched the agency and found that they offer loans for businesses affected by natural disasters. But, having spent so much time on a piece about debt, I wasn't keen on incurring any more than I have already. There had to be another way. 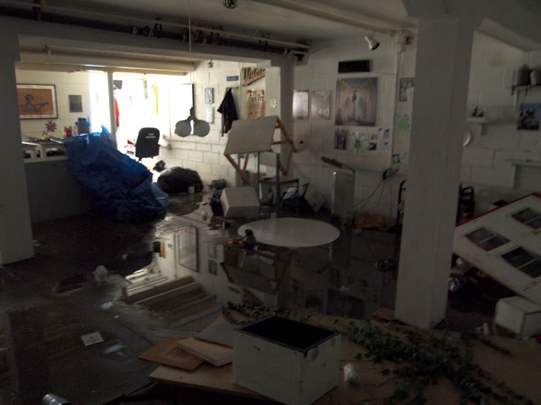 Today you can walk into my studio and never know it had been flooded. Thanks to the support of friends, family and several art groups, I was able to complete "American Debt" and recover from Sandy without resorting to credit. This distinguishes my story from those of so many others across America who've survived disaster only to face a rising tide of debt. Leon Reid IV is a Brooklyn-based public artist. 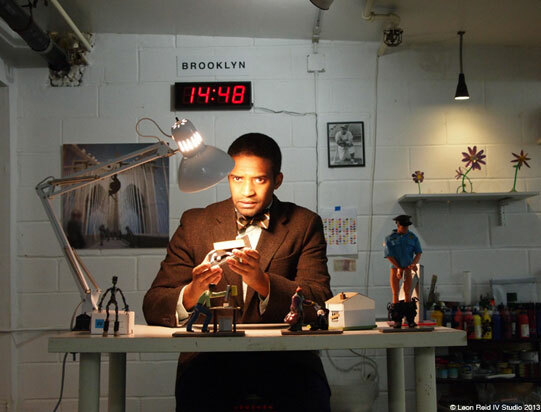 He is currently working on a project called "A Spider Lurks In Brooklyn." Thank you for sharing this thoughtful story. It reminded me of the unforeseen events that can make people go into debt. If we build strong communities, like the one you have but on a broader scale, maybe no one would have to rely on high interest loans to recover from misfortune. I know there are many economic arguments for the virtues of credit, but common sense makes it seem like such a bad idea. Why has it become almost impossible to live without taking on debt? Is this really benefiting society at local and global scales? What can we do to break free of this situation? I agree that strong community is needed, as shown in this story. I think we can break free of debt by caring for each other's well-being and helping out where we can without taking a commission, instead of trying to convince one another to spend irresponsibly. There is something to be said for the self-reliance that credit helps us maintain. I imagine that even the most ardent Communist finds it uncomfortable when he lends someone money and the person never pays it back. Credit gives people an impersonal way to borrow money and a financial incentive to pay it back as soon as possible. It is still a risk for the lender, but they have a financial incentive to take the risk. A vague notion of community helping one another sounds beautiful but I think it would open up a lot more problems in practice.